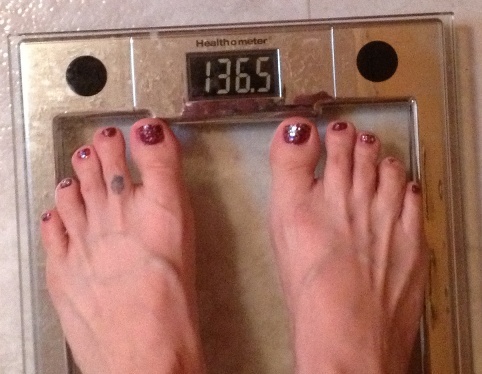 First thing's first: Wednesday Weigh-in. My weight was up a pound this week. I wish I could say that it's because I switched over to maintenance mode this week (allowing myself an extra 6 PointsPlus per day) but it's because I used those extra PP AND I was over my PointsPlus for the week--by 40! As for this week, I'm still going to stay in maintenance mode. When I don't go over my PointsPlus for the week, I can pretty easily maintain or even lose weight while eating these extra PP, and I was just too hungry when my target was 26. I don't think I have anything going on this week that will make it difficult to stay on track. Today is my rest day, and I really didn't do much at all. My little brother, Nathan (by "little", I mean younger than me; he's actually 29), called me to ask if I might want to run a race with him. I was completely shocked; he's not a runner, but I've always secretly hoped he might give it a try. He said my sister had asked him to run a half marathon with her in October, but he had to work that weekend, so he was wondering if I knew of another race. I tried not to scare him off with my excitement, and told him I'd see what I could find. The second I hung up, I was on the computer looking for races this fall. I came up with a list of 6-8 races (half-marathons and 10K's) and sent those to him. He called me back to say that he'd like to do the Monroe Half-Marathon, which is the one that my friend Stacie is directing. I had been considering it anyway, and figured I'd see how I felt after the Chicago Marathon before deciding; but if Nathan wants to do it, I'm for sure in! It's four weeks after Chicago, so I'm sure there won't be any problem with my running it. I also just registered for a Halloween race called Wicked Halloween Run. It will be my third of a three-race series by this company, and I'll get a special "Triple Crown" medal for doing all three. The first was the 10K that I somehow managed to finish in 49:23 this spring (I'm STILL blown away that I did that! ); and the second was the 10-Miler I did in June. It's been really nice having the summer off from racing, but I'm excited for the fall races I have planned now. Speaking of that, Jerry found out that he won't be able to go to Chicago with me for the marathon. I'm SO bummed. We'd been planning to take the kids to my sister's house, and then Jerry and I would meet up with Andrea and her husband in Chicago for the weekend, and then we would go back to Jeanie's for a couple of days. That was before Jerry got a new job. Now, he's scheduled to work the the weekend of the race, so our plans have to change. I haven't figured out yet what I'm going to do. I'll probably just stick with the original plan, only it'll be without Jerry. Noah cracks me up. I have no idea why he started watching HGTV (neither Jerry or I watch it), but that's his favorite channel on TV. He's been asking me questions, totally out of nowhere, like, "Mama, do you prefer a modern home, or more of a country-style?" Today, he was complaining about our house: "Mama, our kitchen is SO dated. We should get darker cupboards and granite counter tops." I nearly burst out laughing, but I didn't want to make him feel bad, so I just told him that I'm fine with my kitchen the way it is. I asked him what else he thought we needed to change, and I got this list--hahaha! That's quite the wishlist ;) I told him that maybe we'll paint his bedroom before school starts, but that's about the best we can do right now. I think it's so funny that he's so interested in this stuff! I told him that if he wants, he could be a designer when he grows up, and he loved that idea. Kids are so cute. I'm a faithful reader but I don't think I've ever commented before. However, I MUST on this post -- that to do list is just hilarious! What a lil cutie!! Hahaha when I was a kid I was obsessed with houses and interior decorating also. Ohmylanta that is hysterical. I especially love, "our kitchen is SO dated." Priceless. My 9 year old is just like that. She's always redesigning our house and drawing plans for her dream house. Maybe my Hosanna and your Noah can join forces to do a kid reality show for HGTV. I think I was into HGTV when I was little. Not sure why. I still watch the occasional House Hunters. I was going to say the same thing about the knobs...I bet he'd be super into it! LOVE Noah's list! What a sweetie! I have sons too and they can be so funny and heartwarming. You're momma do list is so funny. You must keep that in his scrap book! Precious, precious, precious! What a lucky mom you are. Haha, that story about Noah is so hilarious. I love that he made a list and noticed all those things. That is a good idea to let him paint his bedroom, he'd have a blast going to the store and looking through all the colors. He must have been watching House Hunters; in every single house they walk into, they declare the kitchen to be "dated". I wonder if he actually knows what that means! If he starts to call the rooms "this space" then you might have to worry!! Hey - thanks for the mention of the Monroe race! Not sure if I'll do the half (I'm really slow!) or the 5K, but I'm definitely signing up!